Fortive Stop hair loss and strengthen your strands. Bad diet and extensive hair colouring or straightening may dry your hair and worsen its overall condition. Hair structure can also be damaged by excessive exposure to UV radiation. Hair grows more slowly and is more prone to hair loss. This prevents men from getting the hairstyle they want. Weak and damaged hair needs professional and complex care. Fortive collection rebuilds the structure and strengthens hair from the inside. For best results we recommend using the shampoo, conditioner and the serum. 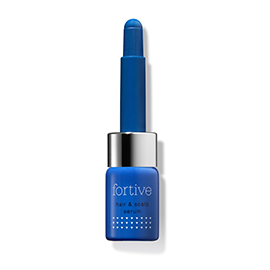 The products from Fortive collection are rich in nutrients such as biotin, keratin and various oils and plant extracts. The ingredients hydrate and strengthen hair, making it thicker and fuller. Argan oil and almond oil also strengthen hair and regenerate the scalp, preventing hair loss. The ingredients such as vitamin B3 and biotin stimulate hair growth and reduce hair loss. Every product from the collection contains unique ingredients, strengthens the results achieved by other products and makes the final effect even more impressiv. For optimeal results we recommend using the shampoo, conditioner and serum. Everyday care for damaged hair. It strengthens the structure without weighing hair down. It does not contain harmful SLS or SLES. Conditioner for frequent use. It rebuilds hair from the inside and accelerates hair growth. It also makes detangling easier. Strengthens follicles, stimulates new hair growth, protects strands from falling out and improves the scalp condition. The product does not weigh hair down.